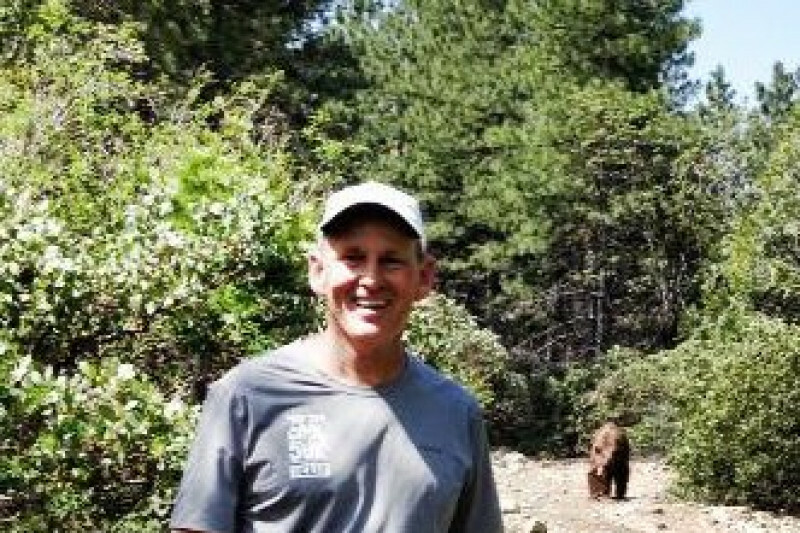 Bill Finkbeiner (Auburn resident, ultra-runner extraordinaire, and one of the nicest guys you could ever meet) was struck by a cyclist on the levee above the American River Parkway on June13. He was on a Tuesday run/walk with running friends as they have done for 25+ years. Bill was struck from behind and went down very hard. He has multiple injuries including skull and facial fractures, a broken wrist which required surgery, lost teeth, and multiple other injuries. He's in the Trauma ICU at UC Davis Medial Center and is expected to recover, but is being closely monitored. His friends think the cyclist might have been a homeless guy - they helped him too, but then he hopped on his bike and rode off. Police, ambulance, medics all showed up quickly. Bill is a self-employed landscape contractor and will be unable to work for the unforseeable future. This fund will help defray lost income and medical expenses. Please consider donating, and please know that no donation is too small. As of yesterday, I am no longer a candidate for the cover of "Mad Magazine". Thanks to Kevin Keane (endodontist) and Dawn Anderson (DDS), I have front teeth again. Today, I had a great day riding with my son, Christian, to Sierra City where he had a job. I sat on the front porch of a store/cafe where the PCT through hikers stop for food, mail, etc. Seeing and talking to them really made me want to get back to the trails. Although I'm not ready for that yet, when I'm just sitting, I feel as if I am ready. Again, I want to say how thankful I am for all so many have done for me. In the first two or three weeks at home, Beth read Facebook and Go Fund Me posts to me daily. Yesterday, when I was thinking about how long I may be sidelined and not feeling good about it, I logged onto Go Fund Me for my first time and read many more recent posts. I didn't realize what a boost I would get from reading them. It completely changed my attitude. Thank you all very much! Thank you to everyone who has contributed to Bill's Recovery Fund. We have all helped Bill concentrate on healing and getting back to his life. We have such a caring community; running friends, car club friends, other friends, neighbors, and those that do not personally know Bill, but have heard his story. Bill has said he gets inspiration from all of us, but it's us that gets inspiration from his strength. Bill continues to get better everyday. He has had severe hamstring pain which originates from the stress to his back muscles. VeLoyce (Monsters of Massage) and a PT have been working to relieve that discomfort. The headaches have mostly subsided, and the hand is healing well, although it still has a long way to go. We're getting close to reaching our goal and appreciate your help in spreading the word. 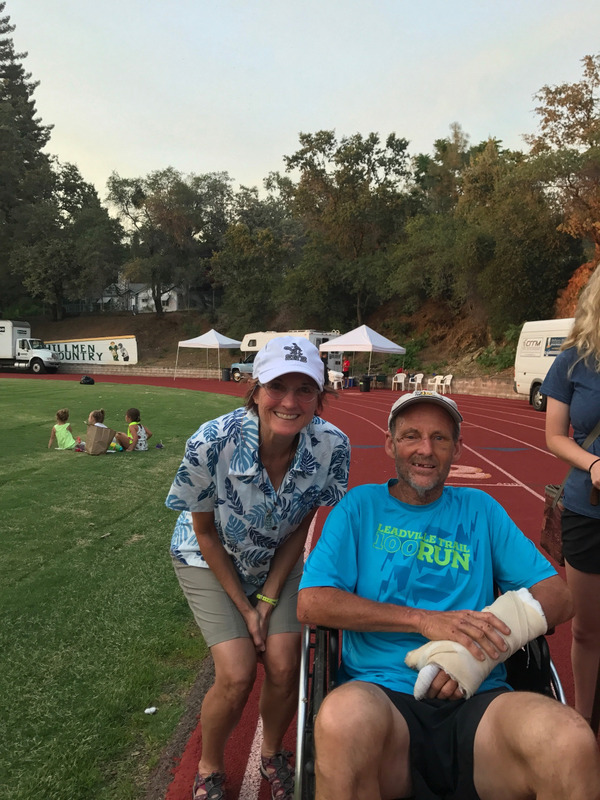 Bill was able to come to the Western States 100 Mile Endurance Run finish line on Saturday evening at Placer High in Auburn. Many of his friends were there and appreciated seeing him at the race he has been part of for so many years. Thank you all again for your donations. Bill is amazed at the support for all of us. Bill at the Western States finish line. Bill has made fantastic improvement this week. His right eye is now open and he has more movement in his left arm. The skin is healing nicely and Bill has more energy. The family is grateful for all the messages, cards, thoughts, actions, and prayers. He still has a long recovery and will not be able to work for some time. We still have a ways to go to reach our goal, so please share this update. Tomorrow (June 24/25) is the Western States 100 Mile Endurance Run. Bill has been a fixture in this race, having run it 18 times (+once as a pacer! ), doing trail work, pacing, and more. Bill wants to spectate, so look for him as we're certain he'll find a way to be there.